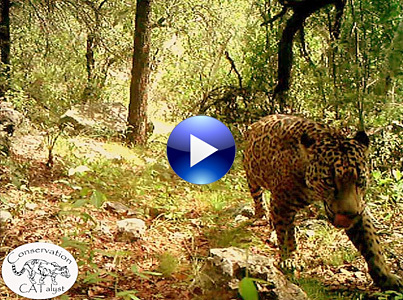 TUCSON, Ariz.— Conservation CATalyst and the Center for Biological Diversity released new video today of the only known wild jaguar currently in the United States. Captured on remote sensor cameras in the Santa Rita Mountains just outside Tucson, the dramatic footage provides a glimpse of the secretive life of one of nature’s most majestic and charismatic creatures. This is the first ever publicly released video of the jaguar, and it comes at a critical point in this cat’s conservation. The video is available for media to embed and use on our Facebook page or for download. The camera project is part of ongoing efforts to monitor mountain ranges in southeastern Arizona for endangered jaguar and ocelot. Chris Bugbee, a biologist with Conservation CATalyst, has been collecting data on the Santa Rita jaguar for the past three years (formerly through the University of Arizona). “Jaguars have always occurred in Arizona and yet we know so little about them in the northern portion of their range. Arizona should be poised to harbor and protect both jaguars and ocelots as they continue to disperse out from Sonora,” said Bugbee. Conservation CATalyst and Center experts are available for interviews and field trips to the area. Conservation CATalyst is a Tucson-based nonprofit organization specializing in conducting scientific research on cats that are in conflict with people.